During 2018, 49 HEI’s and a range of suppliers developed the Aspire project, to audit the quality of accessibility information available from publishers and book platforms. The data is publicly available. Anyone looking at the summary data will be struck by the fact that there is room for improvement across much of the industry. The good news is that it is relatively quick and simple to improve an accessibility statement. Suppliers should already know the accessibility benefits and barriers of their products. Telling end-users about potential benefits and signposting potential barriers is exercising good communication with customers. What makes a good accessibility statement and how is the sector doing? But what makes a good accessibility statement? The Aspire project worked with librarians and disability support professionals to identify the most useful information to help colleges and universities meet student needs. Where this information is available, they can work with studnt reading lists to anticipate problems and maximise opportunities. We scored 87 publishers and 54 platform providers and found a sprinkling of suppliers standing head and shoulders above the rest. If you rank suppliers from highest to lowest scores and take the middle value (the median) as representing the sector, the overall results are depressing. 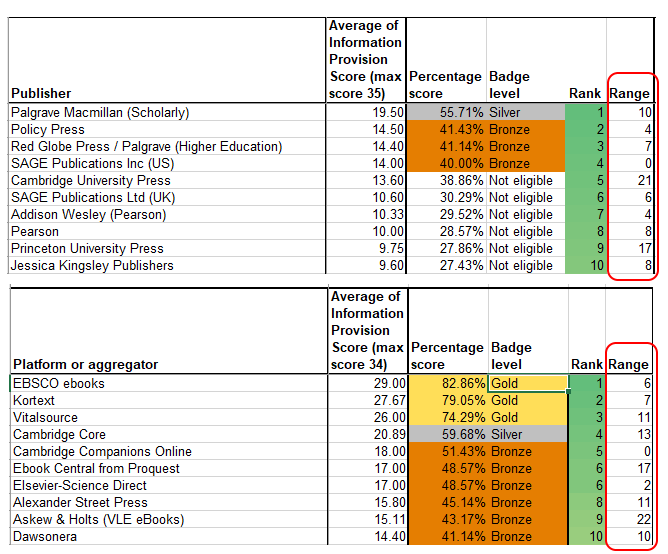 The median score across 87 publishers was 3.3/35, less than 10%. The median score across 54 platform providers was 5.5/34, a little better but still not impressive. What is impressive though is that the best suppliers were scoring 4 – 5x the average. We felt it was appropriate to celebrate the achievements of those who had clearly put more effort into communicating their accessibility information. Annette Moore from the University of Sussex identified three levels of achievement, designing a badge for each that the supplier can use in their marketing if they choose. Suppliers achieving less than 40% are not eligible for a badge until their scores improve, but as soon as appropriate changes to the website have been made and independently verified, we are happy to update the website on a monthly or bimonthly basis (depending on other demands) and we are happy for improved suppliers to vaunt their newly deserved badges! The downloadable spreadsheet has been updated to reflect the badges. Help on interpreting results is available on the Findings section of the website. The eligibility for an Aspire badge is based on the average score a supplier received. The average score was based on multiple audits, often from different websites because accessibility information often existed in more than one place and varied in quality. On the screenshot below, we have included not just the average score per supplier, but also the range. In some cases suppliers with potentially very high scores were undermined by poor accessibility information on other parts of their web estate. Some suppliers may not need to improve their best accessibility information, they may simply need to prune the poorer information in order to qualify for a badge.